A small game about driving a bus as far as possible, as fast as possible while trying to avoid the cops. 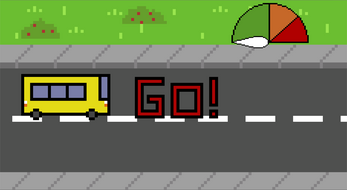 Includes randomly generated obstacles and scenery for some fast-paced police dodging action! Just download the zip file which includes both the 32-bit and 64-bit Windows versions of the game. Hey, cool! Do you have a download available? Sorry if I'm missing something - I just don't see how to download it. Oh shoot, looks like i messed up with the uploading. I'll update the page as soon as I upload it properly.